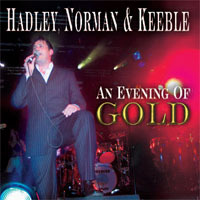 TONY HADLEY, STEVE NORMAN and JOHN KEEBLE shot to worldwide fame as members of SPANDAU BALLET with the Kemp Brothers in the early 80′s and led the ‘New Romantics’ movement in the UK and over the next decade notched up no less than 20 Hit Singles, 3 Platinum and 2 Gold albums. This album was recorded at Pennington’s, Bradford, ENGLAND during 2002 with the band performing to a sold out auditorium all the Hits that Spandau had become famous for with all three musicians on exceptional form. Spandau Ballet announced on 25th March 2009 aboard HMS Belfast, London that they had reformed and were commencing a World Tour in October 2009 with the London O2 arena tickets selling out within 20 minutes and extra dates have been added there because of demand. ...the trio is augmented by a truly cracking band...as they perform all of Spandau Ballet's hits and choice album cuts from their back catalogue. The songs sound as good as they did back in the '80's and there is an interesting choice of cover in Duran Duran’s “Save A Prayer” - interesting given the rivalry between the two bands back in the day (this was on a scale similar to Blur vs Oasis at the height of '90's Britpop).